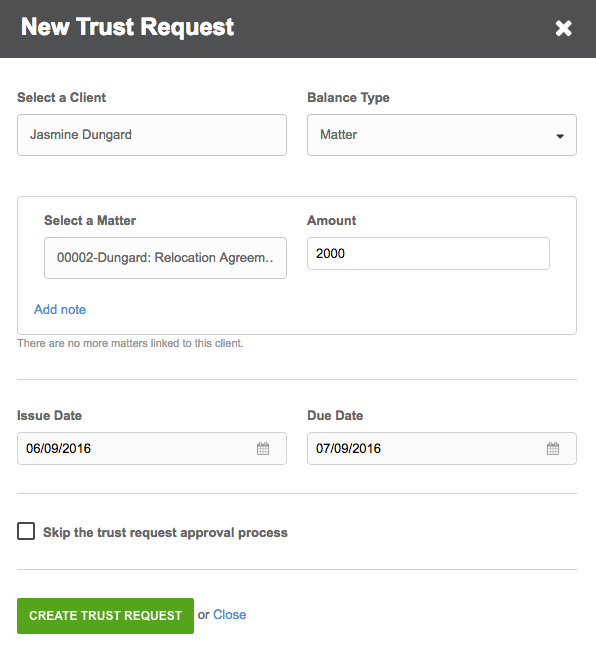 The practice management platform Clio today is introducing Trust Requests, a feature that helps lawyers create and track requests to clients for payments of funds into trust accounts. The feature operates in much the same way as Clio’s invoicing system, but along an entirely separate accounting stream to keep trust deposits and payments separate from standard invoicing. It allows a lawyer to initiate a request to a client for a trust deposit, send the request to the client, and log the deposit to the correct account and matter. It also allows the client to pay the deposit amount using a credit card and have it automatically logged to the account. The feature is available to Clio subscribers who are on the Loyalty, Boutique and Elite plans. 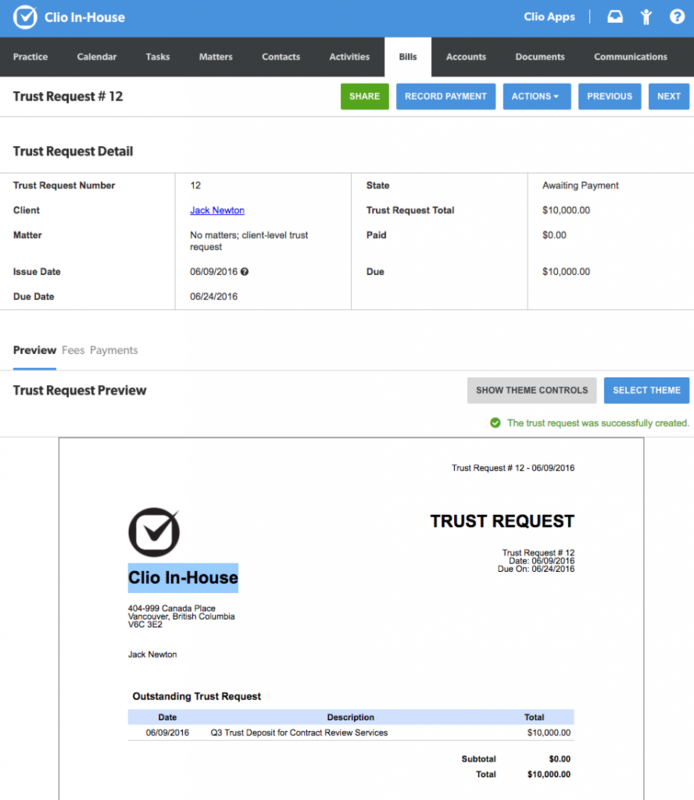 A new button in Clio, New Trust Request, opens a pop-up interface to begin the request. This can be opened from three locations within Clio – the main bills page, the matter page or the client contact page. Trust requests initiated from the matter page will allocate the deposit to the specific matter and the funds will only be available to be used for that matter. Trust requests initiated from the client-contact page will allocate the deposit to the client generally and the funds will be available across all the client’s matters.The form also lets you indicate the date the request should issue and the due date for the deposit. The form also lets you indicate the date the request should issue and the due date for the deposit. From the information the lawyer enters, Clio then generates a draft trust request statement. It looks much like a standard invoice but is conspicuously labeled as a trust request. The lawyer can review and make changes to this draft statement (which bears a watermark identifying it as a draft). Once finalized, it cannot be further edited. Another pop-up form allows the lawyer to enter a trust payment once it is received from the client. The form includes fields for selecting the account, the payment source, the date, a description, and the matter. When the client receives the invoice, the email offers the option of clicking a button to pay the invoice by credit card. That brings the client to a page within Clio where the payment can be made. Clio uses LawPay for payment processing, but no separate LawPay account is required. As a next step in the development of this feature, Clio plans to add the ability to automatically generate trust requests where there is an evergreen retainer agreement. Below is a Clio training video demonstrating the new feature.